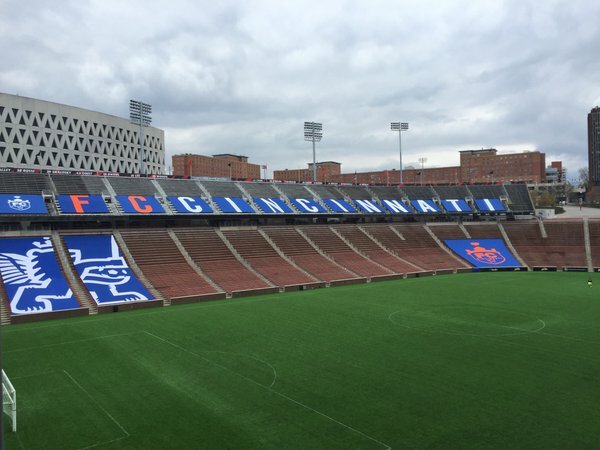 Cincinnati, OH - FC Cincinnati fan Thomas Stephens is, two days later, still in The Bailey section of Nippert Stadium wildly celebrating the FCC victory over the Chicago Fire. "WHERES MY FAMILY AT!" exclaimed a joyful Stephens as he lit off another smokebomb and pulled off his shirt to start twirling it over his head. Friends and family of Mr Stephens became concerned when he didn't come back from the game Wednesday evening, but calls and messages were simply returned with a loud, "WOOOOOOOOOOOOOOOOOOOOOOOOOOOOOOOOOOOOOOOOOOOOOOOOOOOO," signifying that Mr Stephens was, in fact, just fine and enjoying himself. The Nutmeg News reached out to Mr Stephens for comment and he had the following to say, "WE ARE KEEPING THIS TRAIN ROLLING! I'll SEE EVERYONE HERE FOR THE JULY 9 GAME AGAINST RICHMOND! WOOOOOOOOOOOOOO!"